There are some sports where every ounce matters, and where every pound can make the difference between champion, qualifying or being disqualified from the start. Whether it’s wrestling or another kind of athletic event, tournament weigh-in scales are an important factor in determining who gets to compete, who might win, and who will never make it to the floor for a single match. This virtually requires a scale to be ultra precise, providing an extremely accurate read-out that doesn’t disadvantage a player just because the scale “rounds up” too far. Arlyn Scales produces a number of scales that meet the standards and ensure that every athlete gets a fair shot at competition without being disqualified by a scale’s limitations than the rules and regulations of the game. 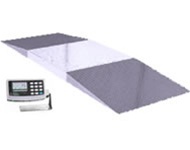 One of the most advanced scales at Arlyn is actually its floor scale model, which combines precise measurements with features like an LCD or LED readout, Ethernet connectivity, and offer the option of supporting a memory stick. Those things might sound excessive or unneeded in athletic environments, but they essentially future-proof the scale and make it compatible with a wide range of applications that serve the needs of athletes around the world. The scale’s technological enhancements actually make it a great tool for tracking weight and uploading data to a computer, via the built-in Ethernet port or via the memory stick that can be used with the scale if included at the time of purchase. That might sound like a stretch but, in many tournament environments, wrestlers and other athletes are actually looking to track their weight and discern how to control it more predictably in future competitions. The scale also features the ability to connect to a printing device, making it possible to automatically print readouts for judges or officials at a sporting event who may require such proof or documentation before the athlete can take the floor. Aside from its extra features, the Arlyn floor scale is a really precise way to measure weight and ensure that it’s accurate enough to favor the true measurement, rather than disadvantage athletes. This is largely due to Arlyn’s extensive experience in catering to industrial environments where accuracy can be the difference between a sound budget and over-spending in regards to tracking and sending shipments between warehouses. That success has been translated into the Arlyn floor scale, which promises to measure weights within a quarter-pound of accuracy. The scale does round up, of course, but a quarter-pound is a far better reading than the half-pound offered by the competition. The base model of the floor scale supports a whopping 5,000 pounds; the scale is typically targeted to industrial environment, as evidenced by this entry-level model, but it’s still perfect for athletes. In fact, its accuracy and the ability to produce printed documentation of weight is exactly what an increasingly sophisticated athletic world is looking for in a scale. However, the Arlyn floor scale could be considered just too large for some gymnasiums and other competition arenas, and this might require a smaller scale product that still pairs the same accuracy with a more compact form. If a compact form factor is what is necessary for a tournament, then the platform scale offered by Arlyn is the perfect solution for virtually every athletic competition. These scales are far smaller than the floor scales mentioned earlier, but their accuracy still permits them to be viable tournament weigh-in scales. Our platform scales, at the entry-level, can measure up to a 500 pound load; these scales measure just 20 inches x 28 inches, making them highly portable and compact enough for even the smallest weigh-in room at a competition. The small size of these platform-style tournament weigh-in scales offered by Arlyn should not be confused with fragility. Indeed, our industrial focus has taught it how to create a scale that can withstand plenty of pressure, shock, and heavy loads; the platform scale is no exception to this rule. We use stainless steel load cells with all of its platform scales, and these are far more durable than the aluminum load cells offered by most of our competitors. Those cells are actually embedded in a welded frame, making the platform scale able to withstand a great deal of shock and resistance. It’s also water resistant, encasing the display with a rubber gasket that keeps out most moisture. And that display is not only water resistant, but also highly visible. We believe that its customers shouldn’t have to squint and get down close to the ground in order to view the highly accurate readout its platform scales produce. This necessitates the inclusion of a one-inch LCD display that is highly readable from even a far distance. Given just how fast-paced and demanding most tournament environments are, this could actually be a lifesaver for teams running behind schedule in their weigh-ins, and it’s a great feature to have on any scale. The scale is also incredibly accurate, with an internal resolution of 1 part in 500,000 and weight accuracy that comes within a tenth of a pound. In an environment where a tenth of a pound can be the difference between competition and disqualification, our scales can save the day and get more players to compete than less accurate scales. This is another area where we have expertise in the industry, combined with its focus on commercial and industrial environments, has improved its scales in a wide variety of ways for more conventional customers. There is really no reason to settle for a scale that could easily disqualify a number of team players from being able to wrestle or otherwise compete in any sporting event. Tournament environments, in particular, are especially strict when it comes to weigh-ins and qualification for a match. Whereas many non-Arlyn scales will settle for being within a half-pound of the accurate weight measurement, we know that athletes require more from their scales and measurements. We have made our name by helping industries and veterinary professionals save time and money with accurate, cutting-edge scale technology. We now bring that same expertise to athletic competition, where a tenth of a pound is revolutionary and can even alter the course of the day’s events. Tournament weigh-in scales benefit from our dedication to excellence in all industries. Those tournament officials or coaches who are looking to promote their players and give them their best shot at competition absolutely need to get in touch with Arlyn Scales. We are determined to find the proper size and style of scale for each application, and we are able to explain where each scale will succeed for the purpose of a tournament or other athletic event. Be sure to get in touch with one of our experts as quickly as possible, in order to be properly outfitted with an ultra-precise scale for your next tournament competition today.